A prominent sports barrister who has previously represented former drug-cheat sprinter Dwain Chambers will try to dissuade the British Boxing Board of Control from putting a virtual end to Dereck Chisora's turbulent career. 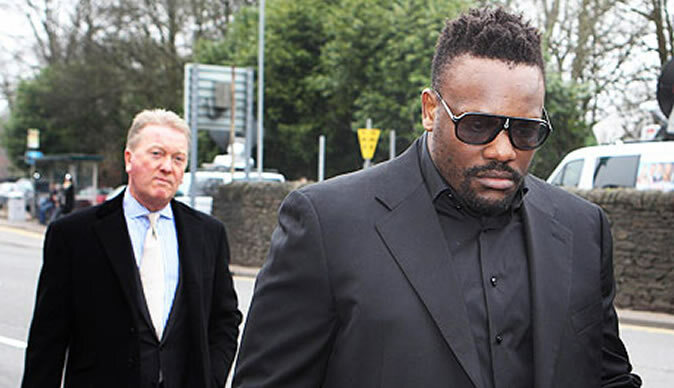 The fear of a lengthy suspension following his self-confessed madness in Munich led Chisora to invest in the best possible legal help at yesterday afternoon's hearing in Cardiff. A life ban for the Londoner, who slapped one world champion Klitschko, spat water over the other, then became engaged in a violent brawl with fellow British heavyweight David Haye, is improbable. If nothing else, such a verdict will be discouraged by the legal implications and potential costs of permanently denying a man his right to earn a living. Be sure that Jonathan Crystal, QC, will be making that as clear as his own name. However, at 28, Chisora will be hoping to be allowed to return to the ring before he is past his prime √É¬¢√¢‚Äö¬¨" and in good time to mount another, more authentic, assault on the world heavyweight title. To that end Chisora was encouraged to give a lengthy interview at the weekend in which he revealed that his mother, who is financially dependent on him, was hospitalised with a panic attack after hearing that he could lose his licence forever. Chisora reiterated his contrition for all the ugliness before and after his quite brave but inevitably failed bid for Vitali Klitschko's WBC world title, while blaming Haye for provoking the shameful post-fight melee which has put both their careers in jeopardy, with Haye still at risk of criminal charges and possible jail time in Germany. Chisora also excused his threat to shoot Haye as a "stupid" heat-o-the-moment reaction to his compatriot punching him while clutching a bottle in his hand, saying: "I would never do that. I don't even own a gun." Curiously, he could not properly explain why he slapped the older Klitschko at the weigh-in and then spat a mouthful of water at the younger brother during the pre-fight formalities in the ring. Nor will he have helped his case by admitting that he threatened to pull out of the fight at the last minute because of a dressing room dispute with Wladimir Klitschko about the wrapping of his hands. Such irresponsibility feeds into his history of erratic behaviour, which includes biting one opponent and assaulting a former girlfriend. Chisora has form but that is not his distinguished barrister's only problem. The court of public opinion has already condemned Chisora for his wild-man behaviour and the board are under severe pressure from all quarters to impose an exemplary sentence.